I have eaten a lot of Mac and Cheese in my day. From the blue box kind to my more adventurous moments of gourmet melted cheeses. We all know pasta and several pounds of cheese does not rank very high on the healthy list. She added a sweet potato and some spinach. Its Stealth Health at it best! In this version, I didn't add the spinach because I didn't have any and I used a Mexican cheese blend for the cheese because that is what I had in my fridge. Its creamy, cheesy and overall amazing. I say this is a must try. THANK YOU ELLA! 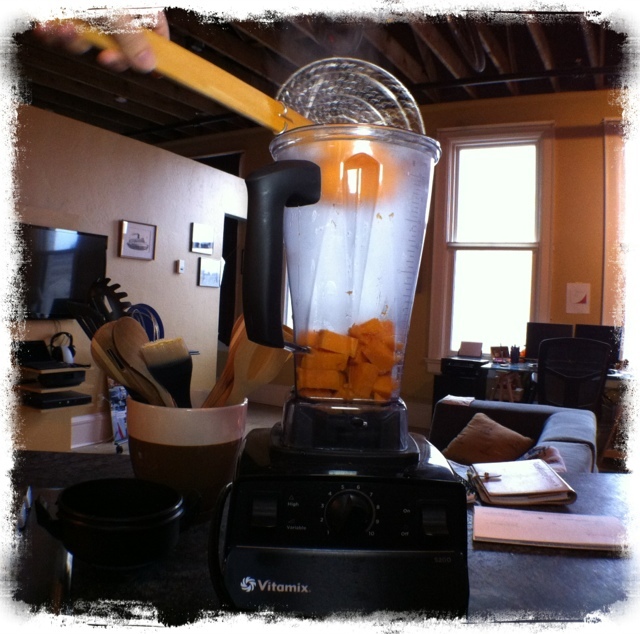 This is how I blend the sweet potatoes and milk together. I use this Vita-mix everyday for something. CJ and I have been looking for a pizza stone for some time. 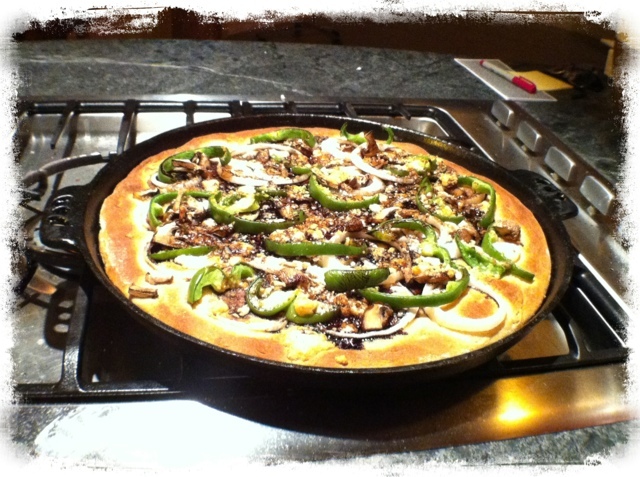 We finally settled on a cast iron pizza pan by Camp Chef. I have been really interested in cast iron lately. I have had a small cast iron skillet for many years now but could never quite get the hang of seasoning it and properly cleaning it without ruining it. After many, many, many videos on YouTube about proper care, I finally understood the awesomeness of cast iron cooking. Another reason why we decided on this pizza pan is that it's not just a pizza pan, it can be used to grill anything. I used it last night to grill avocados and shrimp. It's great on my stove top and in the oven. I needed to find a good healthy dough recipe, but I wanted to avoid a recipe where the dough tasted "too healthy". No matter how healthy or diet friendly a meal is, it must taste good or it's just not worth doing. Naturally Ella's Roasted Brussels Sprouts and Goat Cheese Pizza. I went out and bought everything I needed to make Naturally Ella's Dough. Balsamic Vinegar (I am going to use the same Balsamic Reduction Sauce used in Roasted Brussels Sprouts and Goat Cheese Pizza. 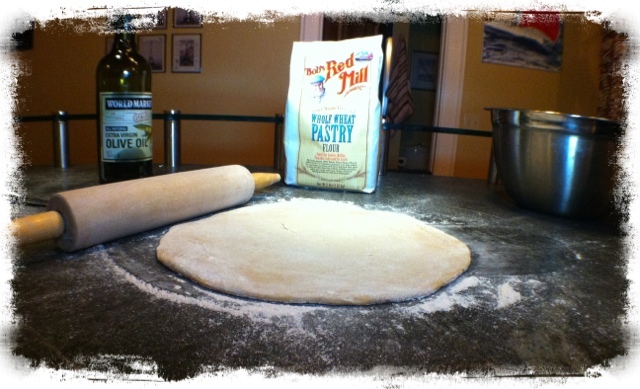 Secondly, I think using Wheat Pastry Flour made the dough a little sweeter and softer than I was expecting. 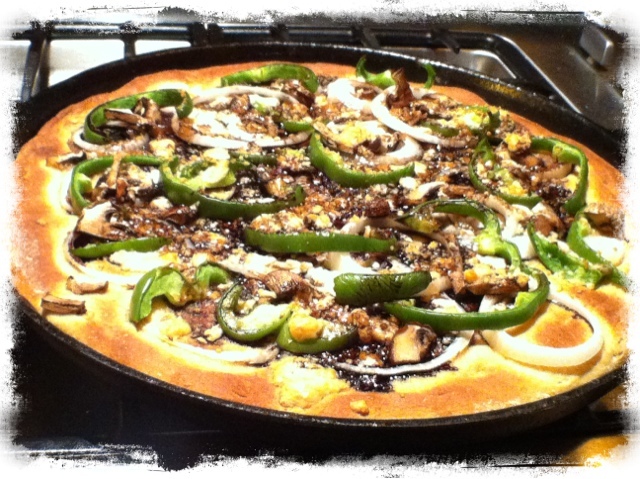 Again, the softness could have been due to the fact that my cast iron pizza pan needed to be pre-heated. Use this dough if you like a sweeter softer crust. It browns nicely and I would add the balsamic reduction to everything, it was just that good. My quest continues to find a pizza dough recipe that works for us. 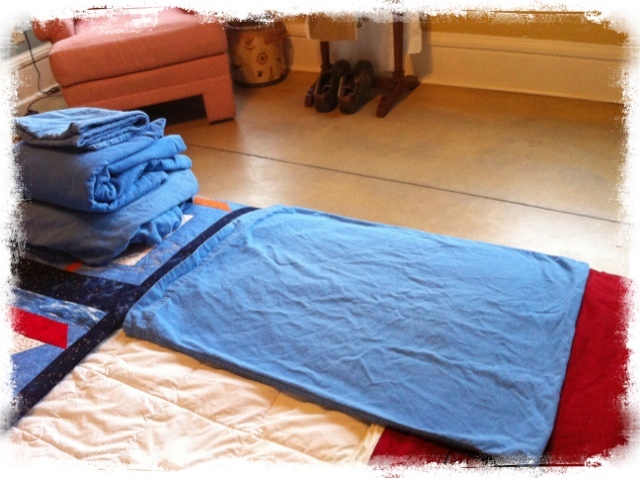 I was doing laundry this morning and wanted to share this tip with you. 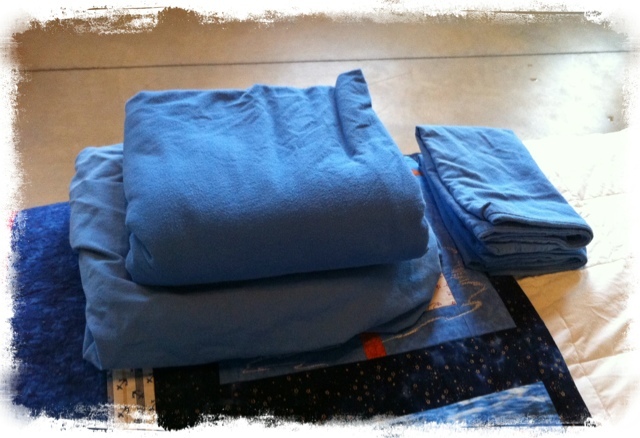 Even misplace part of your sheet set? 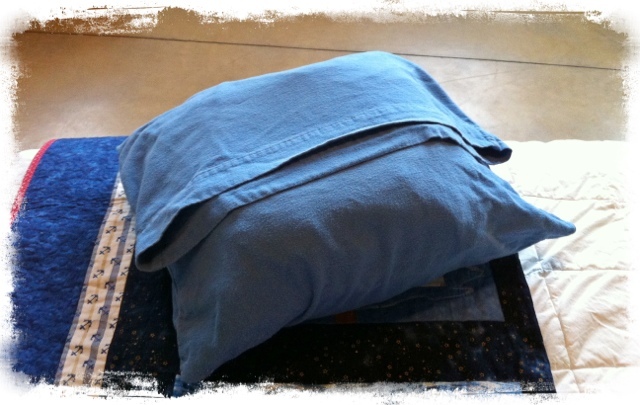 Here is an easy fix - Store your sheets in one of it's matching pillow cases. Neat and tidy and everything stays together. 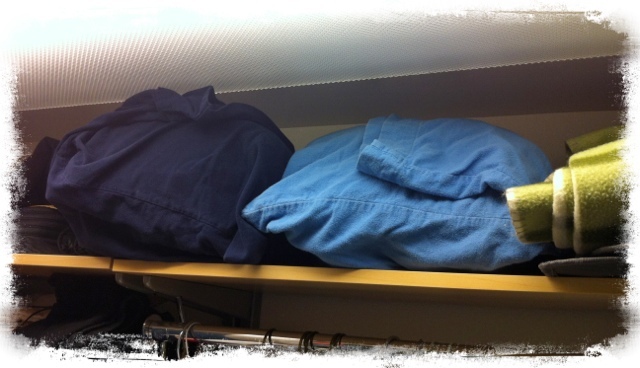 We store our winter sheets on the top shelf in our closet. I lived in Boston till I was 28 years old. I moved to Northern Virginia in 2009. Several times during introductions at my new job, I would tell co-workers where I was from. "Boston, oh my. I could never live there", they would say, "Its snows far too much in New England!" Meanwhile, during the time I lived in Virginia we received record snow fall. When it came time to move to Montana, those same co-workers all teased me about harsh Montanan winters. I have lived here a year now and it has only snowed about 3 times. Matter of fact its been remarkably warm and we have seem many winter days in the 50's. Its almost as if I am have an "opposite weather" effect where ever I happen to be living. My home state of Massachusetts is having a major snow storm today and tomorrow. The Governor has already called a state of emergency, many stores and businesses have already closed down. MA has a issued vehicle traffic ban statewide at 4pm today. That means that if you are on the road and are not an emergency vehicle, you can be subject to a $500 fine! This is a pretty serious storm, I hope everyone stays safe and sound and is able to just enjoy the snowfall. So I have stopped drinking caffeine for a while. In my kick to be healthy, I figured that might be an easy win in the weight loss game. I love tea and recently read in a forum that a pregnant woman was drinking hot water, honey and milk to curb her tea cravings. I am not pregnant but I wanted to try it. It is basically a softer version of warm milk. 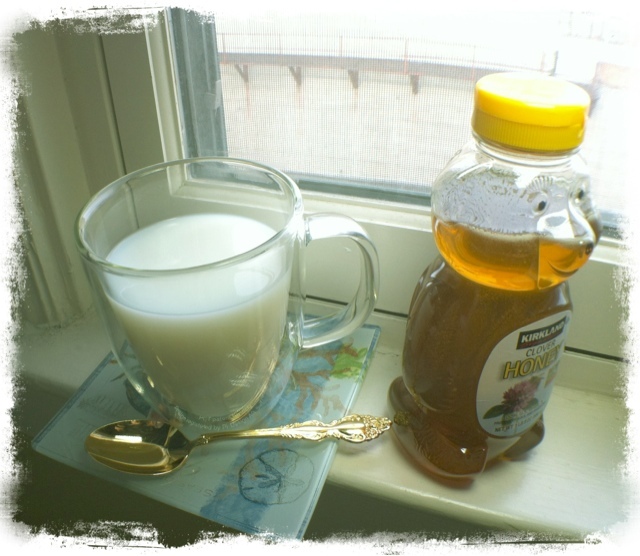 The honey adds some sweetness and its great for cold mornings. I basically prep it like I would tea. Hot Water, teaspoon or two of honey, a splash of milk. Hits the spot and I can avoid the caffeine for now. I am constantly reading food blogs for ideas. There are times when I make the exact recipe and other times, I use the recipe as inspiration. That was the case with Thursday nights dinner. 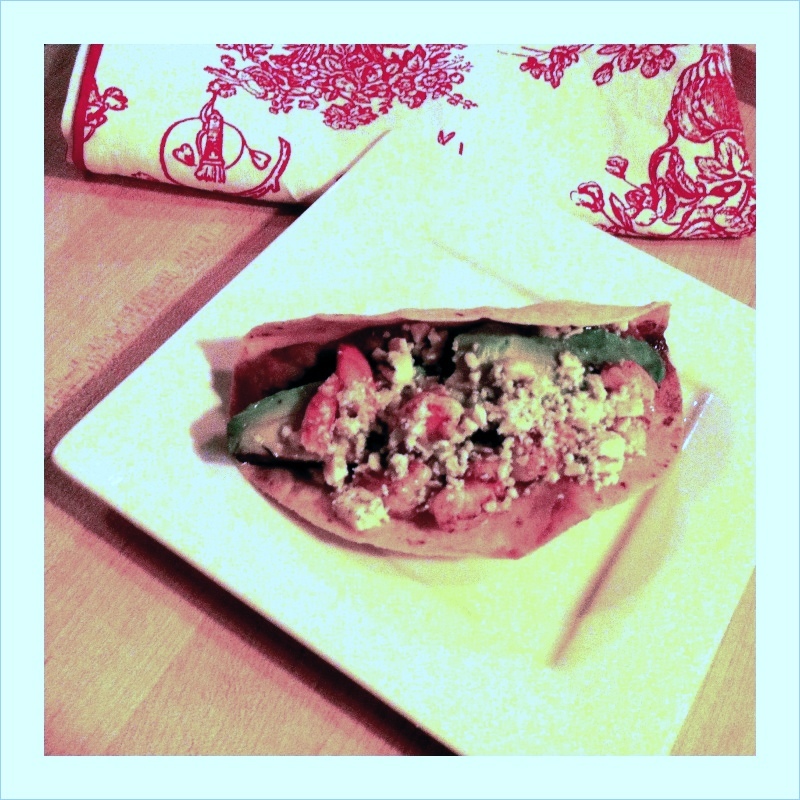 I took my inspiration from Naturally Ella's Spiced Black Bean Grilled Avocado and Goat Cheese Tacos. Check it out, it looks delish. So with that amazing recipe in mind I think - "What do I have in my kitchen that could make something similar?" I know that avocado goes well with Gorgonzola but do they go well with re-fried beans? Back to Google I go to see if anyone else has paired these two ingredients together. Right away I get combination gold at Reesha's Eats: Black-Bean-Gorgonzola Bruschetta. Sweet, now I know that I can happily pair these items up. Now to the kitchen to begin my applied kitchen science. In small bowl combine the re-fried beans, 1/4 tsp cumin and a dash of salt. Cut the avocado in half and brush olive oil on. Please on grill and cook till slightly charred. Carefully slice and remove skin. Cook shrimp on the grill, add a sprinkle of chili power, salt and lime juice to taste. To Assemble Tacos: Layer with re-fried beans, avocado slices then shrimp. Add the Gorgonzola. Finally, whisk together juice and zest from half a lime along with honey. 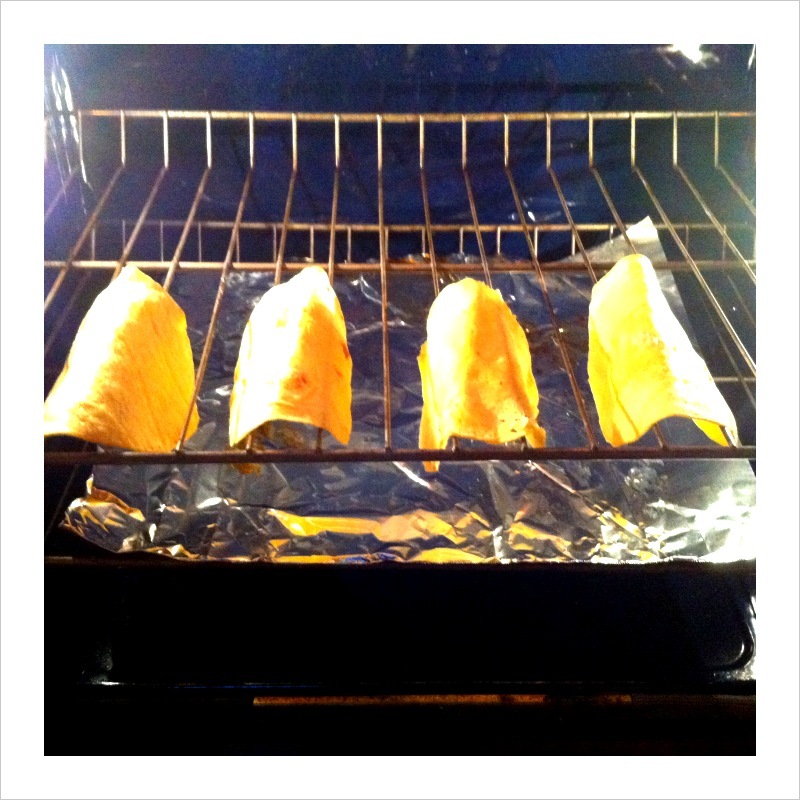 Lightly drizzle over taco filling. In a continued effort to simplify our lives, CJ and I are constantly looking over what we need and what we can sell or donate. This week on the chopping block we sold a pair of work boots that CJ only wore once. We found a couple of other electronic type things that I don't think I can sell (an old router and scanner) so I think I will be dropping it off at the good will. And last but not least, ALL my Wii stuff. 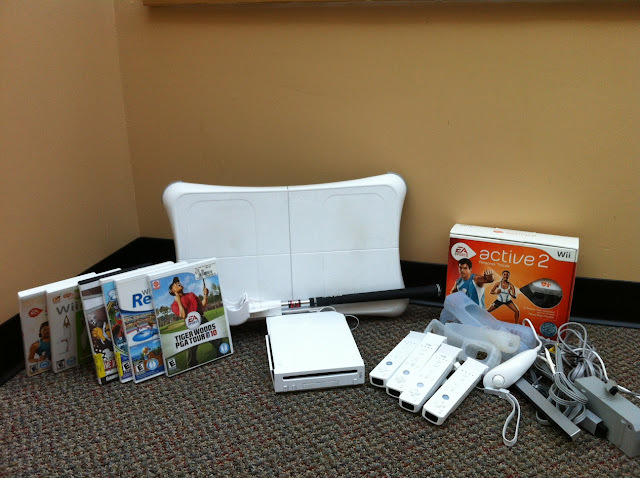 Yes, after not playing anything on the Wii for almost a year, its time to give it up. I think I held on to it for so long because I secretly thought I would become a gamer. Now the only games I play are on my iPad ( Like Fruit Ninja) so it was time. I am not so good at creating meal ideas from scratch.I love finding the recipes of other good chefs than trying to actually make them my own. I find recipes so often on my favorite blog sites that I am actually contemplating getting rid of my cookbooks. 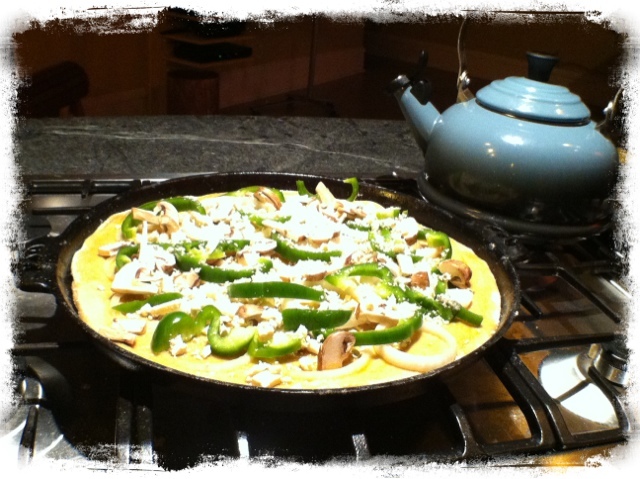 Lately I have been making recipes from a great site "Naturally Ella". Everything I seem to try comes out wonderful. 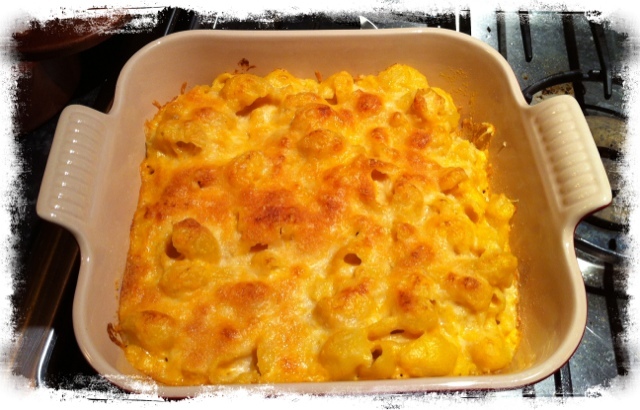 2 days ago, I made her Sweet Potato Spinach Mac and Cheese. It changed CJ's life. So much so that he ate it two days in a row! This is a pretty big deal because he NEVER eats leftovers. (Meanwhile, I would eat the same thing 5 days in a row, I have no issues there). I wish I had a picture to post of it but it just didn't last that long in my house. Although CJ has asked that this recipe become a weekly staple so I will try to post one next week. I do make minor changes to the recipe sometimes based on what I have in my fridge. 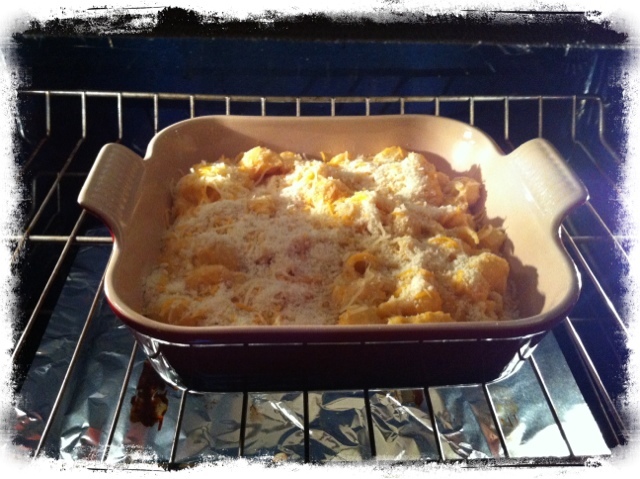 For instance, the Mac and Cheese recipe asked for mozzarella, parmesan ans asiago cheeses. I already had a giant bag of a mexican cheese blend from costco so I used that and sprinkled some parmesan on top. It worked. My point here is that there are some amazing healthy chefs out there.All I do is find recipes that really look amazing and then try to reproduce them. Sometimes what seems like a really great recipe on paper translates into a kinda gross meal. I am happy to get you a heads up on those flops. But most times what seems like a really great recipe on paper translates into a really great meal. And that's what I want to bring to the table here. I topped it off here with a little locally made maple almond granola.